We're getting a movie ready for our Guina'Ang social 1Action. Here's a little clip on how you can help us make the movie-- by sending me a photo of a book and you. I was delighted to make the trip this morning into Bontoc to meet with Joel and his students at Xijen IT college. This college runs independently of the government, yet manages to have vibrant bunch of students-- even if they were a little shy! I've never had to encourage students so much just to hold up their hands to make a comment! I gave them a little overview of the emerging word of social media and the various web technologies that I see at the forefront-- HTML5, Open source SMSs, Facebook Pages, etc. Of course, the 1Mandala is using all these, so I gave them a tour of our backend systems, a philosophical brief on the concept of Oneness, a crash course in sacred geometry, and a short dissertation on Jungian Collective Consciousness. I was really impressed when at the end I asked some random summary question-- and they had not only been listening, but understanding! And of course, I invited them to take a peace portrait. Holding up 1 finger and saying "Peace!" the students of Xijen Information Technolgy College and Russell pose for a peace portrait. The students and college are collaborating to translate the 1Mandala site into Tagalog (the Filippino language) over the next weeks as Russell introduces them to the latest applications of social media, CMS and translation technology. 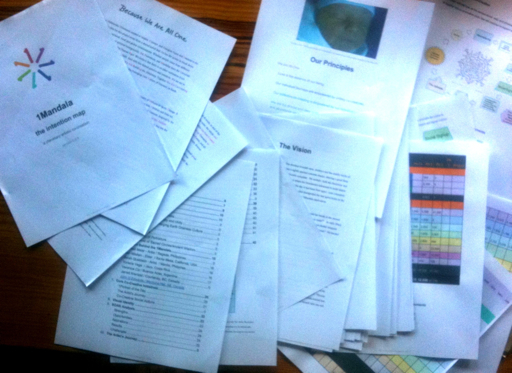 This is a photo of about 50 pages of charts, spreadsheets, prose and point form. This is the 1Mandala Intention Map. This is what I, nay, WE have been working on for the last six months. My team and I have coalesced about 200 pages of google docs into this 50 page equivalent of a business plan. We call it an 'Intention Map'. It takes our meticulously crafted statement of Intention and lays out the two year plan to make it happen. I printed it out just yesterday. What a feeling to hold the document in my hands for the first time! 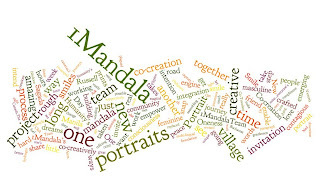 The six of us in the 1Mandala core team have been pouring over it for the last couple weeks now. We're at version 0.9.8. We're almost at the point where we will release it! You can't put together an intention as crystal clear and co-creatively shared as this without the Universe taking note. Already, we have a line-up of business persons eager to see what we have put together. We're applying cutting edge consciousness principles into an incredibly innovative and beautiful endeavour. Many you have followed my tumultuous six months here in Sagada. At times, with resources at a bare minimum, I have questioned my sanity and soul to dedicate so much on this plan without any secure funding, salaries or rewards. I felt like I was jumping of a cliff. Yet, I held fast and persevered. Now, as we emerged with this document, this map and this intention firmly in hand, I am not just getting excited... I am seeing with gratitude my last four months in this small village. To compose and refine a document like this, you gotta be focused. 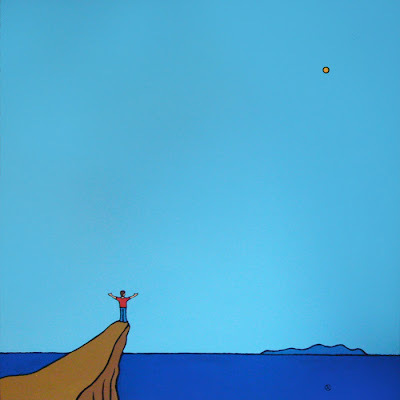 Yet this is a classic Catch 21-- the impossible predicament that faces any entrepreneur. In order to survive with one's work/business/organization/project it needs to be running, and you need to be running it-- not waxing philosophical about principles and intentions! Yet to be successful, you need a solid plan. This is why so few start-ups ever get going and get successful. Yet, being able to live in this isolated place without any distracting opportunities, lovers, or money... I have had an unbelievably amazing and unique moment to mine the requisite clarity. I mean... living expenses are so low here and the people so kind and trusting, its actually been possible. It's little short of a miracle. 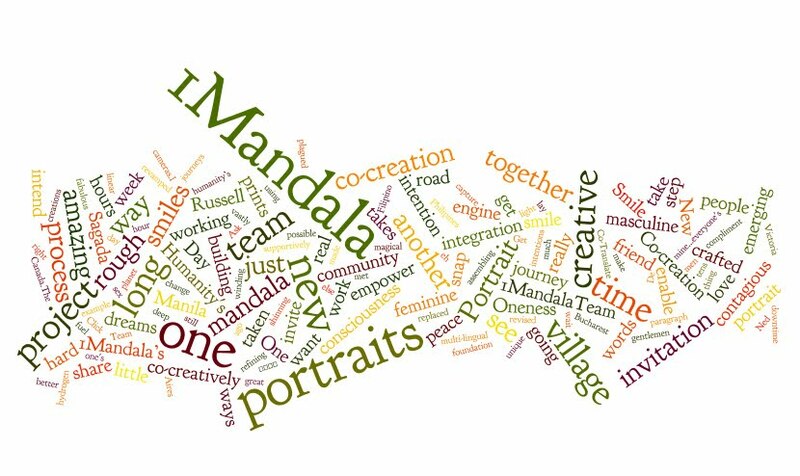 What we're all about in words.... a Wordless creation by Sarah Queblatin created from the 1Mandala blo.